This month's newsletter is about a unique carburetor which was patented by Charles Garrett in 1932. It's a carburetor that turns water into hydrogen and oxygen on demand. Now... I do agree with all the smart physicists out there who conform to the strict laws of thermodynamics and believe that regular electrolysis of water is not efficient enough to produce enough hydrogen and/or oxygen to run a generator or car motor much less produce enough excess energy to run the electrolysis process. Faraday's 1st Law of Electrolysis - The mass of a substance altered at an electrode during electrolysis is directly proportional to the quantity of electricity transferred at that electrode. Quantity of electricity refers to the quantity of electrical charge, typically measured in coulomb. Faraday's 2nd Law of Electrolysis - For a given quantity of electricity (electric charge), the mass of an elemental material altered at an electrode is directly proportional to the element's equivalent weight. The equivalent weight of a substance is its molar mass divided by an integer that depends on the reaction undergone by the material. One coulomb is the amount of electric charge transported in one second by a steady current of one ampere. One coulomb is also the amount of excess charge on the positive side of a capacitance of one farad charged to a potential difference of one volt. Whereas, Faraday's "law" may be true, I also believe it is possible to increase the efficiency of electrolysis. I'm not a physicist and maybe Faraday's 2nd law covers this, but everybody knows, for instance, that adding an electrolyte like sulphuric acid to the water increases the efficiency of the electrolysis. Faraday's laws seem to imply that the efficiency can only be increased by increasing the electrical charge. I do not think that is true. Just as an example, Garrett's patent contains two methods to increase efficiency... 1) a bubbling system (pipe 51 in Fig 2) which removes any bubbles of gas forming on the plates, and 2) a mechanical polarity switching mechanism (Fig 3) which would tend to blast the charged molecules from the plates. Normally, hydrogen gas accumulates on the cathode or negative plates and oxygen accumulates on the anode or positive plates. When these gasses stick to the plates, this reduces the efficiency of the process, so you need to get them off the plate as quickly as possible so more water can come in contact with the plates. If you switch polarity, the like charges will repel each other just as like poles on magnets repel. The bubbles will shoot off the plate and hopefully float up and out of the electrolysis chamber. Sonic waves preferably at the resonant frequency of water or the resonant frequency of the plates. Instead of a constant DC current, maybe use a pulsed DC current at the resonant frequency of water. Maybe use a pump to pump water through the plates and the flowing water will knock the bubbles loose. Using a lower voltage (below 1.47v) endothermic process. Maybe even use a mechanical vibration to knock the bubbles off the plates. Water, he explained, is broken down into its component gases by passage of an electric current through it from electrodes immersed in the water. Hydrogen collects at the negative pole and oxygen at the positive. The hydrogen, Garrett said, is MIXED WITH AIR (78% nitrogen and other gases...Vanguard) and introduced DIRECTLY INTO THE CYLINDERS. He said the electrolysis chamber would have to VARY IN SIZE with the size of the motor used. One of ABOUT A QUART CAPACITY being big enough for the ordinary automobile. The late Henry "Dad" Garrett was a multi-talented Dallas inventor with a bent for electrical contrivances, and in 1935, he and his son, C.H. Garrett, patented and exhibited an automobile that ran on water -- actually, on hydrogen after the water was broken down by electrolysis. Dad Garrett was already famous for his work. In 1920 he set up WRR in Dallas, the world's first municipal radio station, and was its first announcer. He was the first man to build a radio in his car, and he developed radio transmission from the car for police use. He also invented an automatic electric traffic signal, possibly the nation's first. 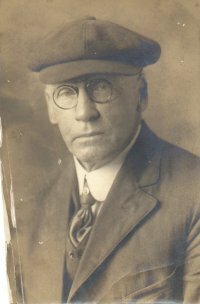 Eugene P. Aldredge recalled the Garretts: "I had rented a small office on the seventh floor of the Allen building in downtown Dallas for my letter service, and one of my early customers was the eighteenth floor National Electric Signal Co. owned by Dad Garrett and son C.H..
"I was informed that the two were experimenting with an automobile that used water for fuel, that they carried on their experiments in a workshop adjacent to their office on the top floor, and that two separate explosions (from dangerous hydrogen) had nearly blown a hole in the roof of the building...Neither was hurt." On September 8, 1935, The Dallas Morning News first announced that the water-fuel concept worked -- at least it worked for "several minutes," the article reported. A few months later, Pathe' News filmed the car driving along Garland Road with the driver stopping at White Rock Lake to fill the fuel tank with water before cruising off. In 1970, Karen Klinefelter wrote, "Aptly enough, the film was shown on Pathe's Stranger than Fiction feature program." C.H. Garrett said the only items needed to convert a gasoline-engine auto to a water burner was an electrolytic carburetor and installation of a generator of double normal capacity for the breaking down of the water. He claimed instant starts in any weather, no fire hazards, cooler operation and plenty of power and speed. The car was not marketed, and no one seems to know its ultimate destiny. Both Garretts died a number of years ago. 1) I think the economy is about to go down the toilet. It's being held together by band aids for now, but that won't last forever. Be prepared - become as self sufficient as possible now. I have a ton of great information in these newsletters, so go back and read it and start preparing now. Extreme solar flares which could knock out the entire electricity grid. Other natural disasters like hurricanes, super volcanos, tsunamis, tornados, etc that could knock out your power for extended periods. As we all know, man made disasters can have the same effect. Terrorists attacks that could disrupt electricity or the oil supply. Peak Oil - it's just a matter of time. A antibiotic resistant virus could come around and bite us in the &%s at any time. That H1N1 thing was just an irritating mosquito bite compared to what could happen. So... we have these many things that "might" happen... what's the chances of just one of them happening to you? Pretty good I would say. The time to prepare is now. If the electricity goes out, so does your water and you can't survive without water, so I would start there and start collecting rain water from your roof. Install a good filtering system too. After that I would install an alternative source of electricity and then after that maybe stock up on a year's supply of food. The time to prepare is now. When it happens, it will be too late. Ever tried to buy plywood, bottled water, food, or a generator the day before a hurricane hits?